Along with coho and king salmon, sockeye salmon is one of the most sought-after species of Pacific salmon to eat. Sockeye is not the largest salmon in the ocean, topping out at only about 6 pounds. Nor is it the fattiest—the king salmon takes that award. But fish connoisseurs claim that sockeye salmon is the most delectable and brilliant-colored of all of the Pacific-caught wild salmon. Sockeye, also known as "red salmon," is full of flavor, with an almost rich aftertaste. Sockeye is considered a firm-flesh salmon, due in part to their long migration patterns from lake or river to sea, and then back again to spawn. They dine mostly on small crustaceans like krill while residing in the ocean, giving them a faint crab-like taste. During their stay in the sea, this nutrient-dense feed helps create both their vibrant color and their strong salmon flavor. 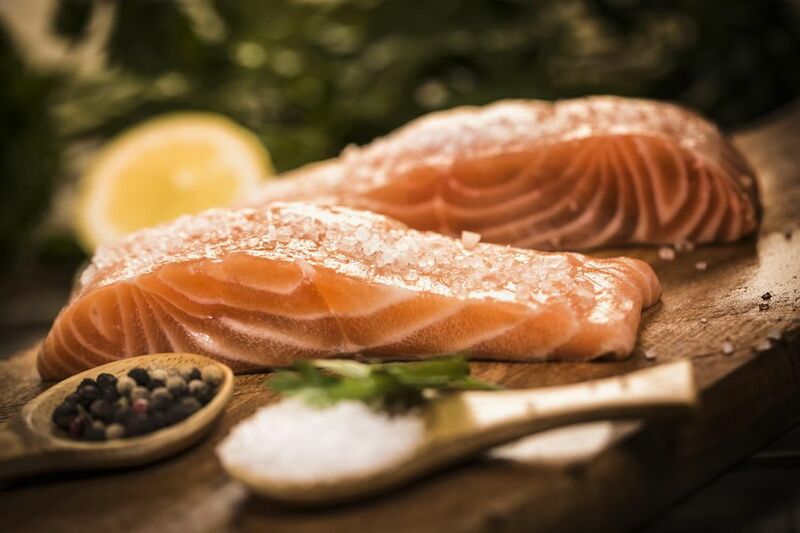 When purchasing salmon always seek out "wild-caught," fresh, or flash-frozen varieties. Sockeye from the Copper River and Bristol Bay are the two most prized varieties and can command exorbitant prices. Still, certain sustainable fishing operations offer home delivery at a fair price. Flash-frozen sockeye can be eaten raw safely in sushi. And canned sockeye maintains its firm texture and rich red color. Buying salmon can be controversial since the fisheries are fragile and the species is susceptible to overfishing. Always make sure to source sustainably-fished sockeye salmon that has been caught with a hook and line by fishermen who follow strict management plans. Buying from sustainable sources—either directly or through a respected retail vendor—assures the quality of the fish you are eating, the health of your family, and fosters the sustainability of a precious resource. Sockeye salmon is firmer than other fish and can be overcooked very easily. For grilling, stick to a simple preparation of olive oil, lemon, and salt and pepper. Due to its complex flavor, sockeye is not a fish to dress up with complex sauces. Grill it flesh-side down and then flip it over, if using an open fire; or skin-side down on a cedar plank. The salmon is done when the flesh begins to flake (usually within 10 minutes). Pan-searing sockeye on your stovetop for 3 minutes on each side works well too. Or you can broil it (similar to grilling) on the top rack of your oven for approximately 3 minutes per side. Poaching the salmon in fish stock or wine for 5 minutes in a non-stick skillet allows the fish to retain its moisture, yielding a melt-in-your-mouth dinner. And with its high fat ratio, sockeye salmon smokes beautifully (if you own a smoker). Wild sockeye salmon demands to be eaten as-is. Finish your sockeye with a pinch of salt, a squeeze of lemon, or a simple sauce. Remember—the less elaborate you make your dish, the better the sockeye tastes. It's best just to let your prized fish's flavor shine.